Recently SAP has released an article about a new plugin that enables you to create hybrid applications in WebIDE. What is a Hybrid application? First of all we have to clarify that we have native, and web-based applications. As you may know native apps have to be programmed and designed for a specific OS. For example if you implement an app for Android, it won’t work on any iOS device. These apps have access to the phone’s OS, and they can use built in features, like camera, GPS etc. On the other hand there are applications which are running in the web browser that can be reached from any platform. But these apps don’t have access to the phones camera. Now SAP wants to build hybrid apps using it’s own tool to pack the apps with Cordova. 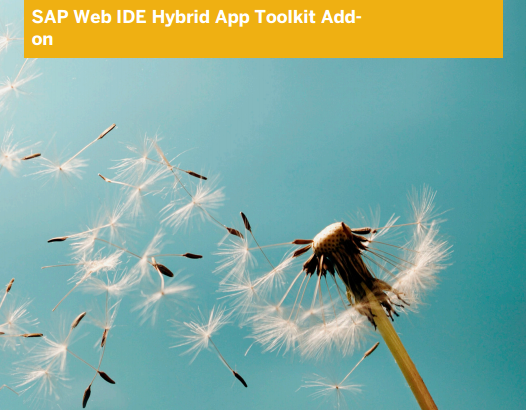 For this they released a toolkit which can be installed into the WebIDE. You can find detailed information about this tool here. A few months ago we started to develop an application which is based on the same hybrid app technology that SAP has just recently started focusing on. We have created an app via PhoneGap/Cordova by using SAPUI5 framework. You can read more detailes about the Android Courier Application here. Blog, SAP Fiori android, fiori, hybrid, ios, native, sap, ui5. permalink. The new SAP Hana Web IDE Developer Guide is out!